As 2018 kicks off, we predict what to expect in the year ahead in travel. Some trends are years in the making and have no signs of stopping: travel keeps growing year over year, food remains a critical aspect of sightseeing, Chinese tourists are increasingly common and sophisticated, terrorist incidents occur but don’t permanently diminish interest in travel, glamping is en vogue with families, walking tours are still the best way to explore a city. Spokane, Washington is breathtaking. So are the ticket prices. In the last decade, there has been a massive consolidation in the commercial airline business. Today, four companies - Southwest, Delta, American and United - represent nearly 70% of US flights, according to Statista. The result is that ticket prices for smaller airports have increased by an average of 10% due to fewer competitors in smaller markets and a reduced number of flights to smaller airports. Prices will continue to rise in 2018. While prices have increased to smaller airports, prices between large travel hubs will drop. The reason for this is the emergence of low-cost airlines that are flying into big cities. The low sticker prices offered by airlines such as Frontier and Spirit are forcing the larger carriers to follow suit. Expect prices for flights to big markets to continue to drop in 2018. If you are suffering from sticker shock for your airfare to Spokane, Memphis or El Paso, just wait. Looking to 2019 and beyond, the low-cost airlines will expand into smaller markets, bringing with them new price competition. Top hotels around the world, from small boutiques to large global chains, will seek to provide guests with unique local experiences. The growth of Airbnb’s Experiences illustrates that travelers want more than just transportation and lodging. As demand for experiential travel grows, so will hotels’ interest to offer solutions. Based on our collaborations with hotels to create branded Sidewalk experiences, companies are looking for ways to engage guests (and non-guests) beyond the hotel lobby, demonstrate their local expertise, and generate new revenue streams. 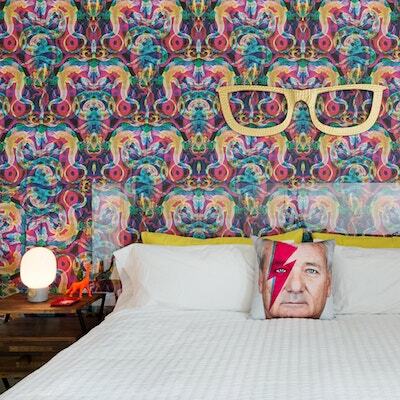 A room at The Guild in Austin, TX celebrates the quirky, Keep-Austin-Weird vibe. As travelers choose from an increasing number of lodging options, hotels will look for new ways to differentiate away from uniformity. Expect to see more showcasing of the local culture, whether it is local design, local decor or local services. Think treats from the chocolatier down the road or a fruit basket with exotic local fruit. Think cooking classes in which a local chef teaches how to make lumpia or tamales or sachertorte. Think in-room photography of local sites and artwork from local artists. 2018 will also see more hotels migrate away from generic design. The last couple of years have seen boutique hotels generate word-of-mouth awareness through their dance club lobbies, common work spaces, craft cocktail bars and quirky rooms. Expect to see that trend continue with larger chains in 2018 as they implement their cyclical refreshes. The last few years have seen a growth in solo travel, especially women who travel on their own. However, in 2018, solo travel will explode as the mainstream perceives it to be more of the norm. A series of factors are at play here: delayed marriage age, higher expendable incomes, better tools & resources for solo travel (such as Sidewalk and online travel forums), and more access to travel inspiration. Expect to see more solo yoga retreats, spa packages, cruises for singles, hotel promotions, and backpacking excursions through Europe and Asia. Business travelers have always tended to mix a fair amount of pleasure with business while on the road. Traditionally it manifested in shoehorning a museum visit between meetings, or a shopping excursion before a return flight. We predict that “bleisure” travel in 2018 will expand to grow beyond the typical weekday trip; business travelers will increasingly tack on an extra day or weekend to spend more time in a city. This is enabled by the relaxing of corporate travel policies, more DIY scheduling of business travel schedules and an increase in employee travel. The most nefarious travel word of 2017 will go mainstream in 2018. “Overtourism” is the imbalance of too many tourists in a certain location that results in overcrowding, pollution, the exodus of locals, deteriorating quality of life and the Disneyfication of a place. Venice, Italy is the poster child of overtourism: a town of 55,000 residents (and shrinking) on 3 square miles that is visited by 60,000 tourists each day. There are several causes of overtourism: exceedingly-successful tourism bureaus, growth in the cruise ship business, decreased cost of travel and the short term home sharing industry. 2018 will be a year in which cities explore solutions to combat overtourism. Expect to see increases in lodging and airport taxes, a crack down on home shares, limits placed on cruise ship companies, and growth in “sustainable tourism” packages. Virtual reality: for those times when you can't wait until 3pm check-in to see the shower in your hotel room. 2018 will be the year when hospitality brands experiment with new consumer-facing technologies. Depending on where you stay, you may be able to preview your hotel room with the help of a virtual reality headset. Some hotels will test interactive maps on the walls that can pop up sites and reviews. Other hotels will allow you unlock your room with your phone. These are the early days for these experiments and not everyone will appreciate being early guinea pigs. These experiments will also be expensive for hotels to implement and many of them will fail. The experiences that will succeed are those that deliver on convenience, speed, ease of use and a familiar Plan B in case of technical glitches. So, wherever 2018 takes you, whether you're jet setting across the globe or discovering the gems of your hometown, we wish you a year filled with adventure, wonder and new memories.